It’s supposed to be blog action day, but I’m going to write about olives. We’re busy packing, tying up loose strings, preparing the animals for our departure from the farm. We’ll be gone for almost a month! And yet, it’s olive season. Usually we drive up to Davis, Ca for olives, but this year we found some right down the street. One tree is in the ghetto. There’re olives on the ground, and a few prostitutes standing on the corner. We picked there first, then went to Emeryville, a weird new tech region of the East Bay. After five minutes of picking from a local parks four trees, a woman yelled at us from her door: “Watch out for the plants! Don’t step on the plantings there.” I couldn’t believe this barbarian. Has she no manners? “Ok,” I was forced to yell. “We’re not stepping on the plants.” The plants were some mexican feather grass. I think it freaked her out that someone was actually harvesting fruit in a neighborhood. We must’ve been so desperate. Maybe we are. 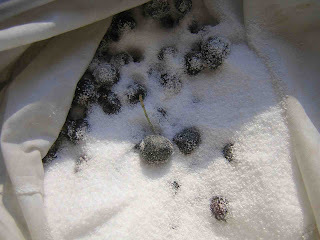 Once home, I washed the olives, poured them into a pillow case, and tossed in a whole box of kosher salt. We’re expecting them to be ready when we return. Please meet my illin’ chicken Ophelia. I came home Friday after a long meeting to find a chicken floating, dead, in the communal chicken/turkey/pig water container. I thought she had fallen in and drowned. When I pulled the chicken out of the water I noticed that she had a huge cut on her head. Since one of the other chickens is missing feathers from the top of her head, I figured it must be the nefarious work of the turkeys. They are pretty brutal (I’ll be slaughtering them in a few days). 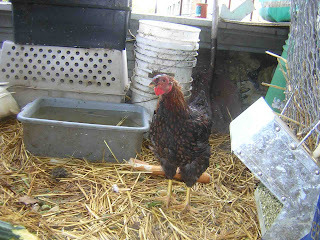 Feeling glum, I tossed the dripping chicken in a bucket and carried her out to the garden where I bury dead animals. Then I saw her beak open and close. Another almost dead animal! I wrapped her in a towel and whipped out the blow dryer. I sang her an Elliot Smith song, which she liked, especially with all that warm air blowing her soft under-feathers dry. Then I put some hydrogen perioxide on her wound. After more singing and blow drying she was warm and finally opened her eyes. She slept in our room during the party, neatly nested up in her towel. The next day I put her outside on the deck to recuperate with the duck, who had similar problems. She’s adjusting nicely and her wound seems to just be a superficial thing. Today I’m going to recruit another chicken from the yard to be her friend so when I reintroduce her to the flock, she won’t be alone. An insta-urban farmer in Brooklyn said he found taking care of animals to be “miserable, soul-crushing work”. I raised a chicken from the dead by singing to her and using a simple tool invented by man. She’ll eventually bear me eggs. How can we consider this anything but the opposite of soul-crushing? Yesterday was Bill’s last day of working for the man. The man being the sweet but bossy owner of the Garage, a high-end Japanese car repair shop. After almost five years, Billy called it quits. To celebrate we invited our best friends over for a party with beer and pork. Pork cooked at low temperatures for many hours. I went to the garden and cut two big banana leaves. Then I rubbed a pork loin with cumin, chipotle, salt, chilis, lime and honey. 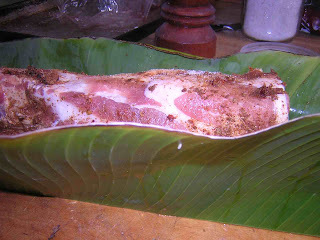 I wrapped the loin in the leaves and put it in the oven. In a cast iron dutch oven, I crammed a rack of spare ribs with pineapple, roasted tomatoes and onion, and put that next to the banana leaf experiment. Then I went to bed. In the morning, the whole apartment smelled sweet and spicy and porky. When the guests arrived at 7, I shredded the spare ribs, unwrapped the banana leaves and fried up tortillas. People pulled strips of tender white meat from the loin and dredged it in the cumin/fat drippings and tossed it on the tortilla with some onion and cilantro. We raised our dripping tacos in toast to Bill. Here’s to quitting. Any bug experts out there? I found this guy in the garden today. 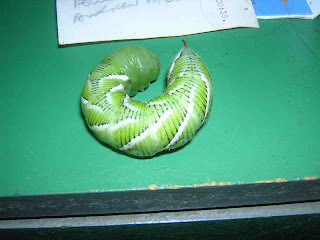 At first I thought it was a cabbage worm and was going to feed him to the chickens. But he sure is big for a cabbage worm–and those stripes! Pest or friend? Anyone know what he is? Manny? Har har. Ok, okay, let’s talk about this guy. He’s an ‘urban farmer’ in Brooklyn. He spent $11K to create an insta-urban farm and wrote about it for New York magazine, which earned him a book deal so he doesn’t have to sweat it–that was money well-spent. In the article we find out that Manny doesn’t know why his chickens are eating their eggs (calcium deficiency), or why his rabbits are killing their babies (improper nesting boxes), and it sure is funny when his kid kills a duckling. He went on a farm fast in August that sounded a lot like mine, except his featured a tornado. The saddest thing, though, was that somehow he thought it would be a good idea to eat a chicken EVERY SINGLE DAY on his farm feast. Dude, that’s a lot of chicken. 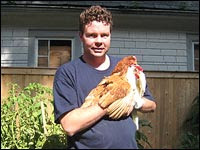 And yet he still, based on this photo, doesn’t know how to hold one (going to break its wing manhandling it like that). No wonder why he sounds a little traumatized on this radio show. Manny, if you’re out there, I challenge you to the following urban farmer rumble (next time I’m in NYC): corn shucking speed round, timed chicken plucking and cleaning (he should be a ringer for this one), and tomato canning contest. Any ties will be broken by a vegetable flash card identification round and a get-to-know-a-bum in five minutes contest. Based on how much popcorn we eat, this cache will last approximately two weeks. 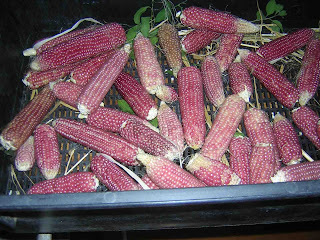 So much for popcorn self-sufficiency…. Found a housesitter! He’s a wonderful, calm friend of a friend. He’s escaping the big city and coming to the East Bay. Three weeks at our house and then he’s got another housesitting gig. He loves the garden. Bill gave him the tour and he asked, Should I weed? That’s a good sign. He also said he’s willing–maybe even excited–to go dumpster diving! 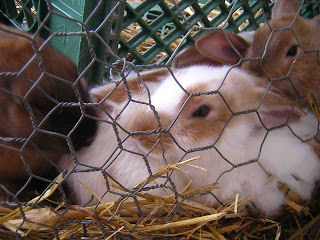 After my friend S picks up her rabbits, it’s just going to be baby rabbits running around the rabbitry. I don’t know this guy very well, but I imagine him hanging out on the couch, covered with little fluffers, in pure heaven. Isn’t that what you would do if you were my bunnysitter?